Dr. Brunet-Jailly also holds a Jean Monnet Chair in Innovative Governance. Click here for more information. Emmanuel Brunet-Jailly joined the School of Public Administration in 2001. He is a political scientist, specializing in comparative border and urban politics and policies. He worked for the French public sector for 10 years, including postings with the French Small Business Administration and the Nord Pas-de-Calais Regional Council. 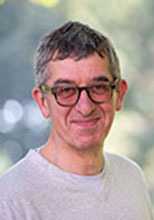 Prior to his appointment at UVic, Emmanuel was an Assistant Professor in the Department of Political Science at the University of Western Ontario from 1999-2000, and Assistant Director of the Nanovic Institute for European Studies at the University of Notre Dame from 2000-2001. Since 2001 Dr. Brunet-Jailly has published over 100 articles and book sections, and 12 books. (52) (R) « Les Disputes Frontalières : Territoriales, Positionnelles et Fonctionnelles », L’Espace Politique, 33/2017-3. (50) (R) Governance – a normative review, Crossborder Cities. Fabienne Leloup. London, UK - Routledge. (in preparation). (46) (R) Languages, Nations and States, Borders and Borderlands; a critical assessment (2017) in Tomek Kamusella and Motoki Nomashi Show Your Tongue: Central Europe Through the Lens of Language and Politics. Hokkaido University Press. (42) (R) in Between the Lines – Social ecologies in border landscapes, Grichting Anna and Michele Zebich-Knos eds. (2016) London: Anthem Press. (41) (R) Contentious Politics, Political Expediency, and The Real Cost of the Icesave Debt in The Icelandic Crisis (2015) Philippe Urfalino, Irma Erlingsdottir, and Valur Ingimurdasom eds. Cambridge University Press. Equal author with H.K. Hallgrimsdottir. (40) (R) Participation of the Urban Poor in Vancouver, Canada, in Andrew Sancton and Chen Zhenming (2015) Citizen Participation at the Local Level in Canada and China, Taylor and Francis. (38) (R) A Review of Cross-Border Cooperation in North America in Iva Miranda and Luis Dominguez (2014) EU Cross Border Cooperation. Routledge. Iceland did not ‘play nicely’ in Acta Sociologica (Sage) (2014) pp.1-15 equal author with H.K. Hallgrimsdottir. (36) (R) The International Activities of Canadian Cities, in Simon Curtis (2014) The Power of Cities in International Relations. Taylor and Francis. Equal author with Ian Madison. (EB11) Encyclopaedia of Border Dispute, ABC-Cleo/Praeger press, CA, USA, three volumes, 1136 pages (2015). Since 2013, Dr. Brunet-Jailly has given over 110 conference papers, invited lectures and keynotes. 2016-2021 “Contentious Politics: Austerity and the rise of nationalism in Europe after the financial crisis”. SSRHC Insight Grant, funded at $89,251. Co-investigator. (Principal Investigator Helga Kristin Hallgrimsdottir). 2017-2019 Jean Monnet Network “Comparing and Contrasting EU Migration and Border Policies - Are they Exemplary? ": 277,117 Euros ($420,000), Principal Investigator. 2017-2019 Jean Monnet Center of Excellence – the UVIc’s European Union Center of Excellence: 95,560 Euros ($130,000), Principal Investigator. 2017-2019 Jean Monnet Chair in Innovative Governance: 44,550 Euros, ($60,000) Principal Investigator. 2017-2018 SSHRC connection grant – ($20,000) Tara Ney (lead) Co-creating justice: exploring citizen-centred design for public service complaints systems (co-applicant). 2015-2019 – Florence Paulhiac, lead, University of Montreal, “Chair InSITU and SSHRC Transport and Innovation.” $250,000 (Co-investigator: $14,000 for the UVic segment of the program). 2013-2020 “Borders in Globalization.” A SSHRC Partnership Grant funded at $3.7 Million. Includes 21 partner universities (10 Canadian, 11 International). Principal Investigator. 2013-2016 “European Center for Excellence.” A European Jean Monnet Grant, funded at €600,000. Principal Investigator. Dr. Brunet-Jailly is currently supervising nine Borders In Globalization research students, four post-doctoral students, and 4 MPA students. Since 2000, he has supervised and served on the committees of 70 graduate MPA, MA, MACD and MADR major reports (598) or theses (599), and seven Ph.D. students. In this video, Dr. Emmanuel Brunet-Jailly delivers his keynote speech at "Rethinking Borders in the Middle East" conference.